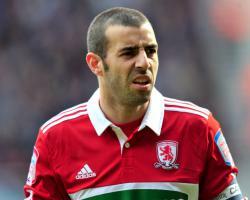 The midfielder who had captained Argentina's Under-20s to World Cup glory, and made in excess of 350 appearances for Sunderland and Middlesbrough after heading for England, turned his back on the game in 2014 which had given him his living after finally succumbing to a lingering toe injury. Arca said: "When I stopped playing professionally, I was.. I don't know if you would call it depressed, but I didn't want to know about football for some reason. I didn't really want to stop playing. I was still hungry to play, I was fit to carry on playing, so I kind of fell off a little bit." On Sunday, 36-year-old Arca will pull on his boots once again to walk out at Wembley Stadium as Northern League South Shields bid for Buildbase FA Vase glory against Cleethorpes Town, having rekindled his love affair in very different surroundings. Still living in Sunderland, where he had settled with his wife and family, he was persuaded by a friend a year or so after his retirement to sample Sunday League football with pub side Willow Pond FC - a far cry from the riches and profile of the Premier League. It was exciting, it was nice to see how much people love football even at that standard. I wanted to win every game and I was shouting at the lads every Sunday." The presence of a genuine star on the city's playing fields caused something of a stir. They thought I was going to be one of those. "After a couple of weeks, they started to know me, I started to know them and I was one of them. No matter who you are or where you come from, I show respect and I like to get respect back." And the partnership between the two has proved to be hugely successful. Sunday's final will see Arca and his Mariners team-mates attempt to complete a remarkable quadruple, having already lifted the EBAC Northern League Division One title, the Durham Challenge Cup and the League Cup. Asked how he had found life at Mariners Park, he said: "Competitive, of course, because everyone wants to win against South Shields, not against Julio Arca. When people see you growing up and they see you doing well, everyone wants to win against you - in a good way. Sometimes, yes, you get naughty tackles - it happens in the Northern League, it happens everywhere - and you get on with it. I never take it personally." The Vase final will also belatedly hand Arca his first chance to play on the famous Wembley turf, something which eluded him as a professional having suffered FA Cup semi-final defeat by Millwall in April 2004 during his time at Sunderland. I always say random things happen in life but it's great, great to be part of the club, great to achieve something like this, to be in the final. Yes, I'm sure the fans are going to have a great weekend no matter what happens, but as a player the way I am, I just want to go there and bring the cup back."